We’re a family of cooks. My mom, the eldest of 9 children was cooking for the household as soon as she was old enough to go to the market, and in Vietnam, that was about the age of a 6th grader. She taught her brothers and sisters well as her younger brother and sister, my uncle and aunt, both have Vietnamese restaurants in Connecticut. When visiting, we don’t go to their home, we go straight to their restaurants. We make sure that we visit my uncle’s Pho 501 and aunt’s Pho 88 restaurant equal homage lest they think we prefer one over the other. As in any sibling rivalry, each claim to have the best restaurant in town. Separated by a mere 5 miles there is a healthy rivalry between the two and each have it’s legion of loyal customers. Besides pho, the other dish they have in common is mi ga, chicken noodle soup. Sold only on the weekends, we can attest that customers come far and wide just to eat mi ga.
Mi ga is one of our favorite noodle dishes because it combines the simple flavors of a broth steeped with chicken along with the great texture of fresh al dente egg noodles. Such a pure dish is actually hard to find even in Little Saigon. Egg noodle restaurants here specialize in more of the Chinese style like egg noodle soups such as mi vit tim or with barbecue pork such as xa xiu. We used ga di bo translated as the ‘walking chicken’ or ‘free range chicken’ which is much more tender, fresher, leaner, and juicier than the butterball or jenny o’ chicken. It’s given the name because these chickens were raised on free range and allowed to roam freely instead of being contained. This ‘walking chicken’ is found in Asian markets and a little bit more pricier than regular chicken but it is well worth it. They are a delicious, clean, and healthy source of protein. In large stock pot, add roasted onion, ginger, dried squid, and chicken bones and enough water to cover the ingredients and add 1 tbs salt and sugar. Bring to slow boil and be diligent in skimming the gunk and scum from the broth. When you have removed most of the gunk, add the chicken and keep the stock at a slow simmer and cook chicken for about 35 minutes. Remove chicken and let cool, but covered in plastic wrap. Remove and discard chicken bones. Season the stock with more salt and sugar as needed. When cooled, break down the chicken by shredding the breast and meat of the hindquarters into thin strips. The meat should really just almost fall off the bone without much effort. Using butcher’s knife, chop the drumsticks and wings. Set the shredded chicken aside. 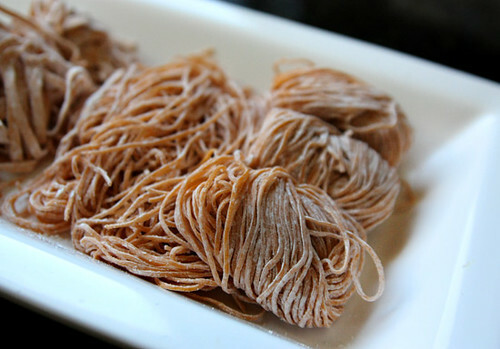 Prepare your egg noodles by unraveling the pre-portioned bundle of noodles. Bring a large pot of water to boil and in large colander, dip a bundle for 10 seconds, remove and rinse in cold water. You want these noodles to be al dente. Drain and transfer to serving bowl. Drizzle the noodles with some pure sesame oil. Add the fresh fried onions, chives, shredded chicken, and ladle on broth. 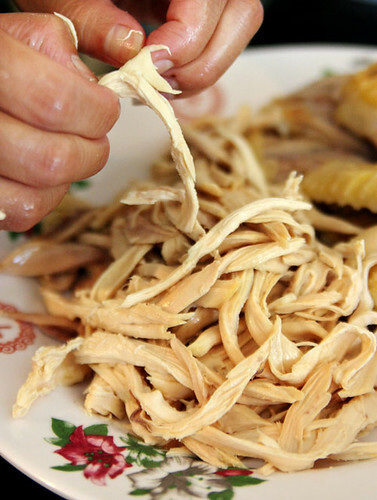 When cooled, break down the chicken by shredding the breast and meat of the hindquarters into thin strips. The meat should really just almost fall off the bone without much effort. Using butcher's knife, chop the drumsticks and wings. Set the shredded chicken aside. With Hong driving and me typing, we are frantically trying to submit this post to Delicious Vietnam #5 before we cross the border to Vancouver, Canada before we lose internet connection. Thank goodness for new technology and mifis allowing us to blog and take road trips at the same time! 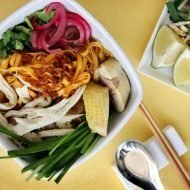 Delicious Vietnam is a monthly blogging event celebrating Vietnamese cuisine created by Anh of A Food Lovers Journey and yours truly! This month’s host is Anh of A Food Lovers Journey Submissions are due Sunday Sept 12 at 7:00 pm pacific time. 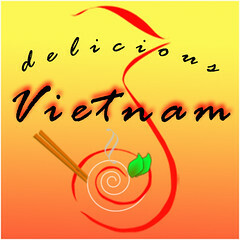 For instructions on how you can participate, visit Delicious Vietnam information page. 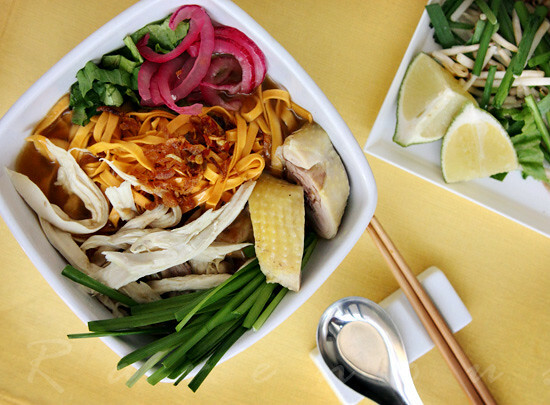 I admit I like this recipe much better than pho ga as well! Yum!! Wow, I am salivating right now. This looks amazing! 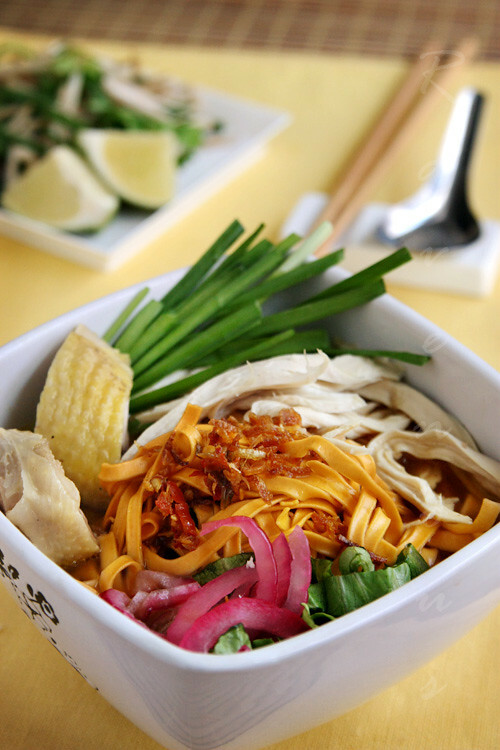 What a beautiful & colorful bowl of noodles! I'd love a bowl right now! It was noodles that first led me to your blog, and it is noodles (like this dish) that keep me coming back. Just in time as the weather starts to cool. My mom adds an extra step with the noodles that I quite like: after the noodles have been "cooked" and drained, she adds ~1tsp sweetened soy sauce (1/2c soy sauce mixed with 1 tsp sugar)& a few drops of sesame seed oil, toss and then add you toppings and broth. That is so cool that your Aunt and Uncle have restaurants. My family use to have one too but they have since sold it. I think my mom uses fish sauce instead of salt in the . I like dipping the chicken in some fish sauce for extra flavor. Looks great, healthy and delicious. Thank you so much for posting this! As I write, I have about 4 kg of bones in the fridge waiting to make chicken stock today. I will set aside half to make this recipe. Love the addition of dried squid; never seen that before. 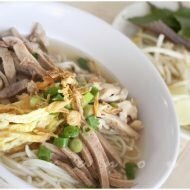 How is pho ga different? More aromatics? I have never had pho ga, I just can't go past the pho bo every time. Wonderful soup.. so perfect for fall, and it looks like a million bucks! This is a wonderful soup that my family would really enjoy! Beautiful post, beautiful recipe! I love the term 'walking chicken' and I will pop a link to this on my fb comfort food page. Cheers! Sounds so AMAZING. One of the most enticing looking chicken noodle soups I've ever seen. And I may have to go to Connecticut sometime to visit your relatives' restaurants! The composition in the bowl is awesome with all the colors and textures. Well, guys, you may have done this in a hurry, but the photos are stellar, and once again you have my mouth watering. I'm a bit sad I can't find fresh egg noodles here, but th broth sounds so good perhaps I won't notice! thank you so much everyone for all your comments..we just got back from a fabulous vacation in Seattle and Vancouver and happy to read these. yum that looks so homey and delicious! The colors are great. And so are the flavors. This would be an easy recipe for us to try. Yum! I am going to make this. So they chicken doesn't need to be baked first, it's just boiled? I love to cook so when I found this web site just like found the treasure. Thanks for sharing the recipe. is this like Pho Ga? 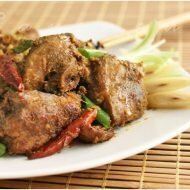 I was in Vietnam a few years ago and ate it every day… I have been looking for a really good authentic recipe.. Even if it isn’t, this looks amazing!! no, this is slightly different since it has egg noodles, but this is good too! made this twice already. 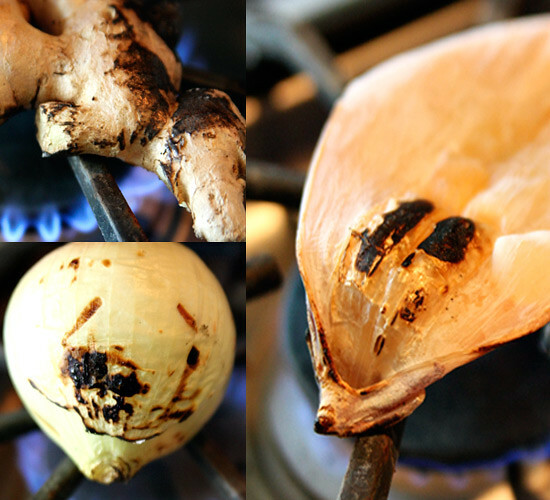 my family and I love the simplicity of this dish yet very flavorful. Love your blog. will be making nem nuong with nuoc cham today . 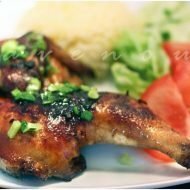 i just came upon your website; i was recently in Vietnam and am interested in cooking Vietnamese food here in the US. I was also recently in Hartford, CT, and wondering if that is where your uncle and aunt’s restaurants are. i tried to visit Pho 501 & Le’s on a dark, rainy, Tuesday night, but both were closed by 8 pm. If they’re your relative’s, i’m sorry i missed them! yes, pho 501 is my uncle’s! you definitely have to come early and if you want mi ga, it’s only on the weekends, and again come early!